Ashtabula County’s latest barn quilt requires a boat to view it. At 4-by-4 feet, the barn quilt can’t be seen with the naked eye from Lakeshore Park. With a pair of good binoculars, you can just discern the outline of the object on the east side of the Ashtabula Lighthouse. The barn quilt was painted by John Carpenter, who volunteers with the Ashtabula Lighthouse Restoration and Preservation Society. John chose the mariner’s compass pattern, a fitting motif for an object that guided freighters into Ashtabula Harbor for more than 60 years. The nonprofit group has been in control of the lighthouse since 2007. Grants and fundraising resources were used to the structure/crib and add a staircase and floating dock. But there is much work to be done before lighthouse can open for education/interpretation. Joe Santiana, president of the group, took me and a newspaper reporter to the lighthouse on Sept. 14 for a look at the structure and barn quilt. I have visited the lighthouse on prior occasions, and each time left wishing that in my younger years I’d turned my lens toward documenting life on the structure before it was automated in 1973. A bald eagle claims the former foundation of the lighthouse. On our way out, we passed the lighthouse’s former foundation, approximately 1,750 feet closer to the shore than the current location. Ashtabula Harbor’s docks and railroads experienced a surge of expansion and growth starting in 1908, and that required a larger inner harbor and expansion of the breakwater. In 1916 the lighthouse was moved to its current location and doubled in size. A 50-foot-square concrete crib was built to accommodate the lighthouse, which was doubled in size. Further, future expansions of an emergency generator and air compressor to run the fog horn would need to be accommodated. The stone breakwater was extended from Walnut Beach, and while it is possible to walk the long, jagged breakwater to the lighthouse, it is very dangerous. 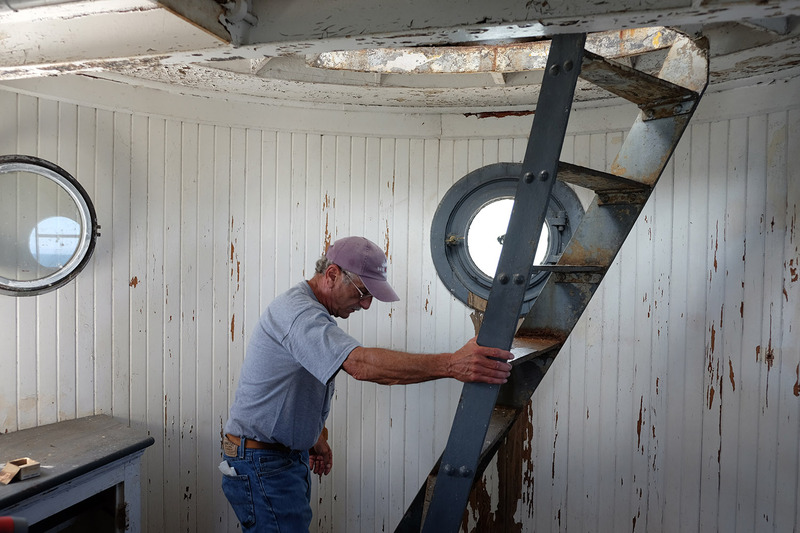 Joe Santiana, president of the Ashtabula Lighthouse Preservation and Restoration Society climbs the ladder to the upper lamp room in the Ashtabula Lighthouse. While an iconic and lovely bump on the west breakwater of Ashtabula Harbor, the metal structure was built for functionality. Its interior is spartan. The first floor is a big, dark empty room that once provided the living and sleeping quarters. Above it are the two levels that accommodated the light and fog horn. The Fresnel lens ended up in the Ashtabula Maritime and Surface Transportation Museum. The fog horn and related equipment were possibly dumped in Lake Erie. The white structure was recently painted, but the large population of gulls and other birds at this point have coated the lighthouse in white excrement. Not the most pleasant place to be, even on a beautiful September afternoon on Lake Erie. 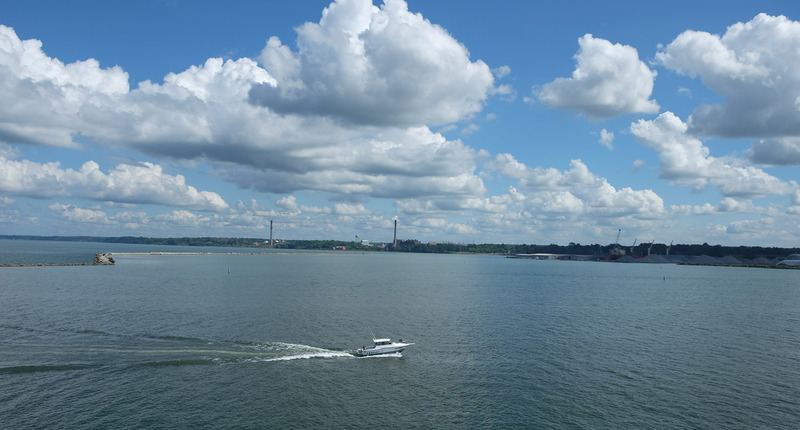 The view of Ashtabula Harbor from the top of the lighthouse is stunning; perhaps why the spot is so popular with birds! 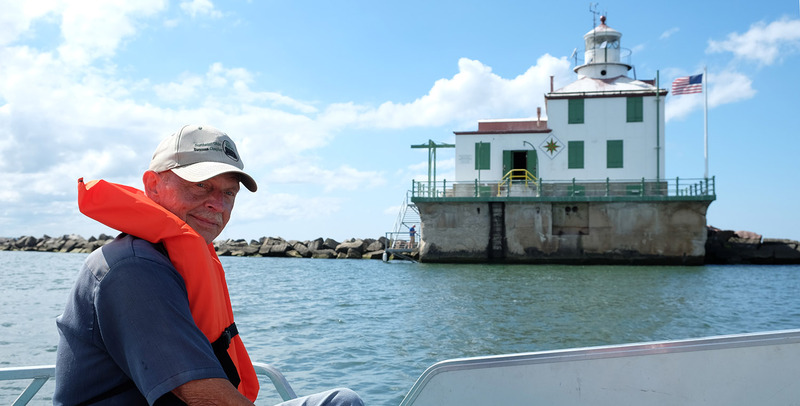 The Ashtabula light was the last on the Great Lakes to be automated . 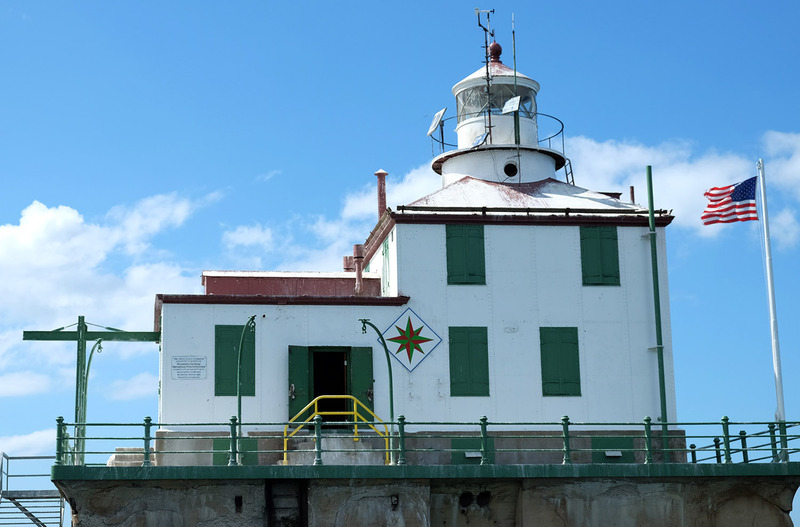 A solar-powered light glows in the top room of the structure and is maintained by the US Coast Guard. Otherwise, it is the society’s responsibility to care for the lighthouse, which was purchased as government surplus. John Carpenter painted the Mariner’s Compass barn quilt that is on the Ashtabula Lighthouse. The presence of a barn quilt this far north of the city and at the entrance to the harbor suggests the start of a truly unique barn quilt trail, one that could stretch from Lake Erie to the Ohio River. This 100-mile journey is rich in heritage and stories, not to mention some lovely, well-kept barns in Trumbull, Mahoning and Columbia counties. These four stacked counites have been linked for centuries via the stagecoach turnpike, Underground Railroad, the Pennsylvania and New York Central railroads and Route 11. Iron ore that supplied the steel mills of the Ohio River towns came through Ashtabula Harbor, and coal that moved up the river and railroads moved through Ashtabula Harbor.